It was perhaps a year ago that I tried the demo for an early version of Star Chamber. 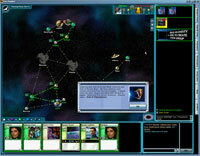 It was a promising game, a mixture of space strategy (a la Spaceward Ho!) and card play (a la Magic: The Gathering). It was clearly more of a proof-of-concept demo than a full-fledged game at the point at which I tried it, and more features were promised "soon." I set the game aside and forgot about it for a while. The other week, I read an announcement that Star Chamber: The Harbinger Saga had been released for the Mac. Always interested in games I can play on my laptop on long flights, I took a look. And I would like to say to the authors of Star Chamber: "You've come a long way, baby." The game is true to its original conception — space strategy game meets collectible card game — so there are no surprises there. What is surprising is the amount of polish that has gone into the presentation. And when I say "polish," I don't mean frills like full-motion video, or egregious 3Disms, but just in terms of a well thought out design, balanced gameplay, and consistent user interface. The strategic part of the game is composed of a few simple elements that mesh into a pleasantly complex whole. The object of the game is to win. You win by outright military conquest (taking over your opponent's homeworld), cultural conquest (generating a 30 point "culture gap" over your opponent), or through political intrigue (winning 3 "power play" votes in the game's legislature). 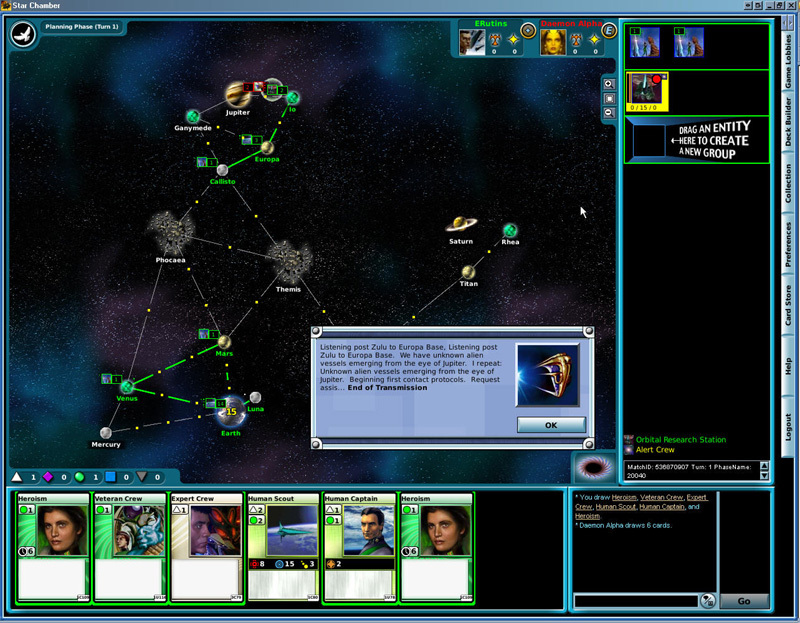 Players can build ships or citizens by expending build points. Players can own industrial planets (which generate build points), artifact planets (which generate "culture,"), or barren planets (which do nothing). One owns a planet by having more citizens (or "influence") there than one's opponent. Complicating matters is that every 6 turns there is a vote at a special location called the "Star Chamber". Each point of influence you have there gives you one vote; winning votes at the Star Chamber can net you special ships, additional culture, or outright victory. Determining the right balance of citizens to keep on planets to generate military might versus citizens stationed on the Star Chamber to act in upcoming votes is one of the central challenges of the game. All of these elements would make for an interesting game even without the card-playing element. But the card-playing aspect of the game improves it. 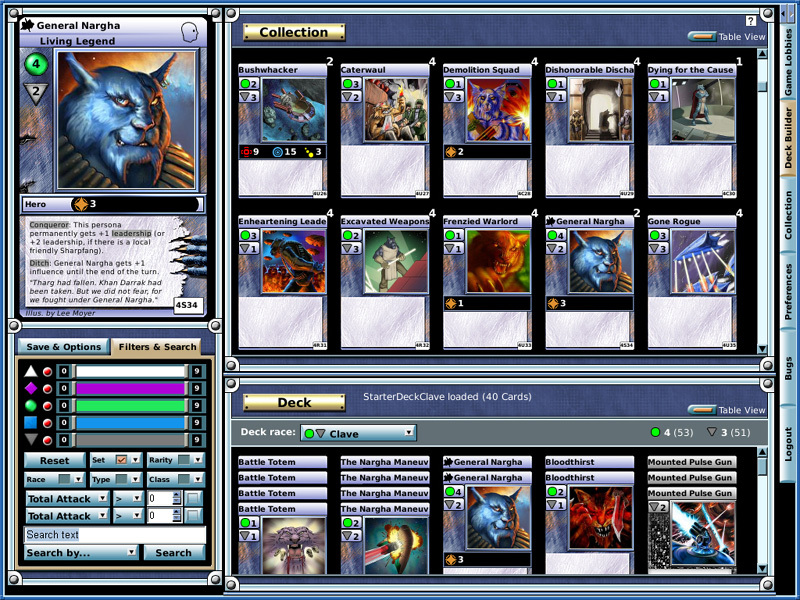 I am, to be frank, not much of a fan of collectible card games. I like looking at pretty cards, but I'm the antediluvian sort who wants to buy a game and then stop buying it. This is the same reason I'm constitutionally incompatible with multiplayer online RPGs. A lot of the effort in the new versions of Star Chamber goes into simulating the trappings of traditionally CCGs; you can buy "starter paks" of cards, or "booster paks", and you even get to see their labels or wrappers before you "open" them. Most of this is lost on me, but I appreciate the finesse with which it was done. When you buy the game you get a few sets of cards with the price of the game so you don't have to bankrupt yourself to get started playing online. 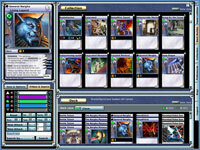 There is no required ongoing subsciption fee to play online, although Worlds Apart does try — in subtle, not at all tacky ways — to get you to buy more (for example, by sponsoring regular "sealed deck" tournaments, and so on). The game also comes with two sets of very challenging single player campaigns. The single player campaigns use their own built-in decks so if, like me, you are an antisocial hermit you can enjoy this aspect of the game without talking to another living soul. The game itself is superbly balanced. The fear that one should have when hearing the game described is that it will not be a true strategy game, but rather the thin veneer of a strategy game wrapped around a collectible card game. Such is not the case here. It is a true hybrid. The best hand of cards in the world will not help you escape bonehead mistakes. The cards' strongest effects seem to be to increase momentum when one is playing the strategic game correctly. You're almost never going to win or lose a battle based on playing a card; rather, the cards typically influence by how much you win or lose the battle, which plays in to how many resources (ships, heroes, citizens) you have available to fight future battles. I have a few minor complaints about the game. Although the UI is mostly good (especially while in the game proper), there are a few places in the pre-game setup where the navigation cues are inconsistent, and some of the naming is a bit odd (why choose "Gaming Lobbies" when the more accurate and easier to understand "Main Menu" is available?) But overall, I enjoyed the game greatly. I purchased the Mac version on general principles, but Matrix Games and Worlds Apart graciously gave me a review license for the PC version so I could compare and contrast the two. They are for all intents and purposes identical, so you should not feel that you are getting short shrift by buying one or the other. Star Chamber is a nice development for the strategy gamer: a game that is based on traditional mechanics, but which, through a little judicious genre-mixing, brings something new to the table. The Star Chamber website has quite a lot of information about the game, and you can download a free demo for Macintosh or Windows. If you like space strategy games, it is definitely worth your time.